Rashid Khalidi is an American academic of extraordinary ability and sharp insights. He is also deeply committed to stemming violence in the Middle East, promoting a culture that embraces human rights as a fundamental notion, and building democratic societies. In a sense, Khalidi’s formula for solving the Middle East crisis has not been radically different from George W. Bush’s: both believe in American values and approaches. However, whereas Bush believes these values can be introduced in the wake of bombs and at the barrel of a gun, Khalidi disagrees. He sees education and civic activism as the path to success, and he argues that pervasive military interventionism has historically undermined the Middle East and will continue to do so. Barnett Rubin, who knows Khalidi, is also one of the most intelligent expert commentators on Iran, Afghanistan, and the Middle East, and his site Informed Comment is well worth adding to your daily rounds. Horton’s pretty damn smart too, but reading his blog always makes me feel under-educated, so go there only if you have a less sensitive ego than mine. How best to respond to the McCain camps sleazy smearing of Rashid Khalidi as an anti-Semite and the equivalent of a “neo-Nazi”? Politically, the Obama campaign is doing the right thing, stating that this issue is distraction from real politics. True enough. But outside electorial politics, it’s important to loudly proclaim that Khalidi is an important scholar who should be part of the foreign policy conversation in both the United States and the Middle East. So I wholeheartedly support Ezra Klein’s idea that we should buy copies of Khalidi’s The Iron Cage: The Palestinian Struggle for Statehood. Presumably, this experience has not been a pleasant one for Khalidi. But it would be nice if some good emerged from it in the form of broader familiarity with his important works. So next time you hear Hannity explain how Rashid Khalidi urinates on a Haggadah during full moons, head over to Amazon and pick up a copy of The Iron Cage: The Story of the Palestinian Struggle for Statehood . Its an important book on its own terms, and its purchase is a worthy counter-statement to this type of anti-Arab fearmongering. 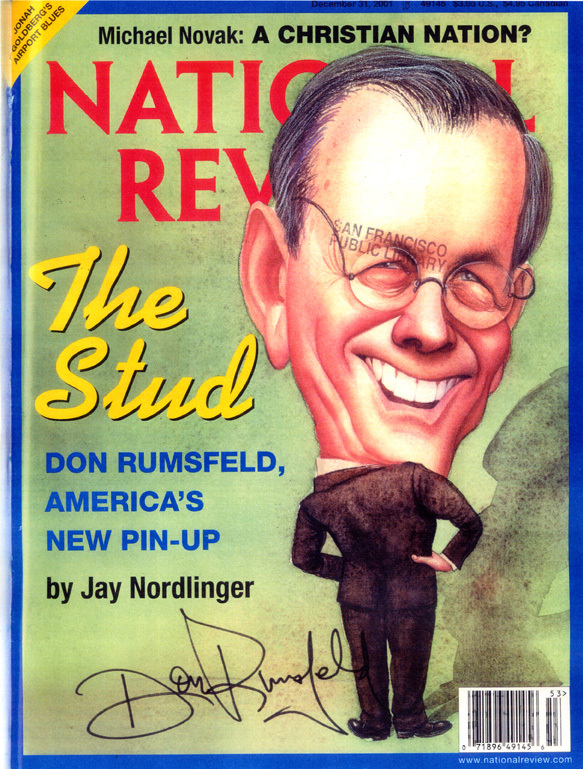 National Review loves Donald Rumsfeld; doesn’t care for Christopher Buckley or Jeffrey Hart. Perhaps because so many of its founding editors were erstwhile Stalinists and Trotskyists, the editors of National Review have always had a propensity for purges, ideological house-cleanings that involve black-balling those who don’t follow the party line. Some of these purges have been entirely justified: the conservative magazine did well to kick out kooks like Revilo Oliver and the Birchers in the early 1960s. And good riddance to the Randians as well. Other purges have been regrettable: anti-war libertarians were a strong presence on the American right till National Review started boycotting them. It would have been nice if those anti-war voices had remained part of the conservative conversation. Now the magazine seems to be going through another one of its periodic ideological civil wars, kicking out anyone who might have a kind word to say about Barack Obama. As has been widely discussed, Christopher Buckley, son of founding editor William F. Buckley, lost his column in the magazine after he wrote an endorsement of Obama (an article that ran in another publication, The Daily Beast). 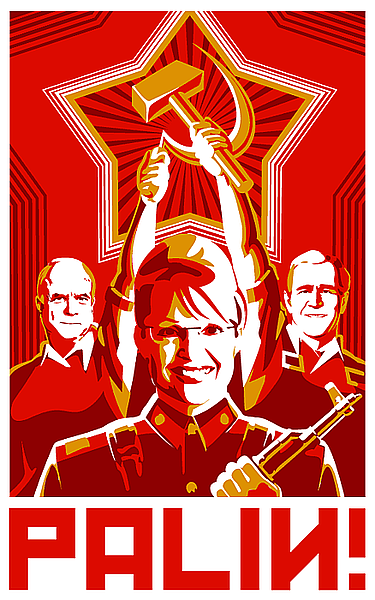 With tongues protruding into their cheeks, many writers have compared the Bush administration to the early Bolsheviks. The points of overlap include ideological rigidity, messianic internationalism, contempt for traditional diplomatic norms and Old Europe, a tolerance for torture camps scattered far and wide, and a propensity to nationalize large industries. Having said all that, the comparison is deeply unfair. Whatever else you want to say about the Bolsheviks, we should never forget that it was the Red Army that crushed Hitler. By contrast, the Republicans haven’t even been able to defeat the Taliban, who will be governing Afghanistan again soon enough. The Soviet peoples made enormous blood sacrifices during the Great Patriotic War. It was their heroism and suffering that ensured that Nazism would be utterly destroyed, never to rise up again. I don’t see the Bush administration leaving a comparable legacy. We should be clear about this: since the death of Edward Said, Rashid Khalidi has been the pre-eminent Arab-American intellectual. He is a small-d democrat. If the United States is serious in its goal of spreading democracy and peace in the Middle East (a big if), then it needs to work with respected figures like Khalidi. And indeed in an earlier life, John McCain was well aware of this fact, since he steered money to a research institute founded by Khalidi. Spencer Ackerman makes exactly the right point on this issue: to libel a scholar like Khalidi as a big scary terrorist Arab monster is nothing less than racism. 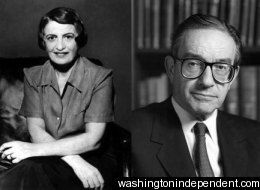 When he was young, Alan Greenspan suckled at the bony breasts of Ayn Rand, drinking in as his mother’s milk libertarian and Objectivist thought. After being furthered mentored by Milton Friedman, Greenspan rose to ranks of policy making until he became Federal Reserve chairman. In that position he was the world’s pre-eminent advocate of neo-liberalism, always quick to lecture on the need for deregulation so that markets could do their magic. And now with the current global financial crisis something completely unexpected has happened. Greenspan, age 82 and a very old dog indeed, has learned something new: that markets don’t always give you the best result.